Industry Institute Symposium is a one day program for all stakeholders in technical education. The main objectives are to identify career opportunities for technical Graduates in public, private and multinational organizations, to explore the opportunities for placements through competitive examinations, to provide platform for lifelong learning for stakeholders, to strengthen the relationship with all the stakeholders through their engagement, to develop quality models for enhancing technical capacity and capabilities. To identify career opportunities for Engineering Graduates in dream and core engineering sectors. To explore opportunities of industry oriented trading for enhancing core placement. To explore opportunities of placement through internship. To provide platform for interaction and interdisciplinary learning for stakeholders. Brainstorm and provide solutions to the key challenges faced by students in securing core placements. Create awareness about the recent trends in core engineering sectors among stakeholders. Networking among all stakeholders to facilitate training and placements for students to make them future ready. In order to keep student knowledge updated and also to make them aware of latest trends, department arranges various expert lectures on different topics. The lectures are delivered by experts from Industry/academics. At ASM, research forms an integral part of our work ethos. We have a full-fledged research cell that is equipped with excellent resources for research in terms of journals, reference books, subscription to online magazines and more. The cell works on various research activities for industry-sponsored projects. ASM also hosts research based events like the International Conference (INCON) and the case study based event ‘Mindspace’ annually to bring together industry and academia for the benefit of its students and faculty. ASM has a publication called the ASM Business Review to its credit, which consists of research papers of stalwarts from the field of business and academics. This is a program that provides working professionals with the opportunity to complete their education. Every year we have over 500 such corporate students who study executive programs. Training and MDP programmed are rendered to various organizations across sectors like manufacturing, IT, FMCG by our in-house faculty, knowledge partners, domain partners, experts from the industry on – Workshops for Professionals on Various Topics of Relevance at Work, Staff Training on Organizational Effectiveness, Workshops on Innovative and Strategic Marketing, Workshops on JAVA, .NET for Application-based Operations, Workshops on Strategic Planning and Decision-making, Soft-skill Orientation for Junior and Middle Management Staff. In order to meet the requirements of fast changing marketing conditions, management needs to be dealt with a scientific approach. Our consultancy services enable the organizations to adopt a micro-perspective strategy. In effect this efficient resolution of biz-challenges. Identification of new avenues and niche markets. Brand building, positioning, analysis of consumer buying behavior and attitude. IT audits and processes to implement improvised system-based operations. Human capital resourcing for lateral positions. Evaluation of financial soundness of a business enterprise. Preparation and evaluation of financial project report for new as well as existing entrepreneurs. 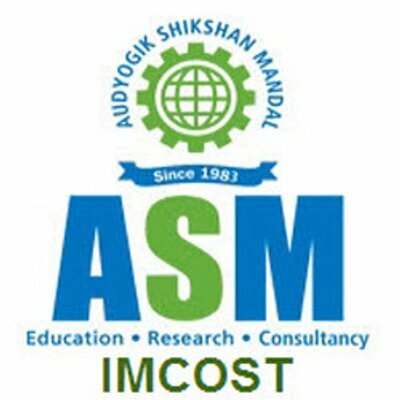 It was in 2004-2005 a strong urge was felt, by the management of ASM Group of Institutes to initiative to certain programs at the group institutes to revive and strengthen the institute – industry Interaction from a long term perspective. We at the ASM Group of Institutes set up to try to formulate an event which facilitates a dialogue between our students, faculty and the industry executives through a competition hosted by the institute and participated by the industries in and around Thane. Over the years, due to amazing support shown by the industries, Mindscape competition has come to be recognized as a ‘SIGNATURE’ event of the ASM.IMCOST MINDSPACE CASE STUDY COMPETITION is perhaps the only one such event conducted amongst all B-schools in India including IIMs. It is also remarkable that the mindspace competition is extremely ‘student Centric’ and all the preparatory work for the event is carried out by the students of the group Institutes The MindspaceCompetition is about industry teams competing through their presentation on the analysis of selected case studies on various issues of business managements in areas such as Finance, Marketing, Operations, Human resource etc provided by the ASM IMCOST mindspace Committee. The competition is held at the ASM campus and the Jury for the evaluation is from industries and academia. On account of increased crave for opportunities for conceptualization skills since the year 2006 there is an offshoot of the mindspace event “COLLAGE COMPETITION”; providing major national and international themes on current issues to the students to develop and present their conceptual skills in the Collage Competition coinciding with the mindspace completion.